Good guy Microsoft. They open a new retail Store in the heart of busy Long Island but also worked heavily with the community. Members of the Huntington and Melville business councils were on hand as were a few charity and support groups. The money will go a long way in helping those group build up and maintain necessary infrastructure with Microsoft software. We only point this out because Apple rarely gives to charity (estimated to be 0.1 percent of the company's cash holdings) and they never really work with communities on such a level. 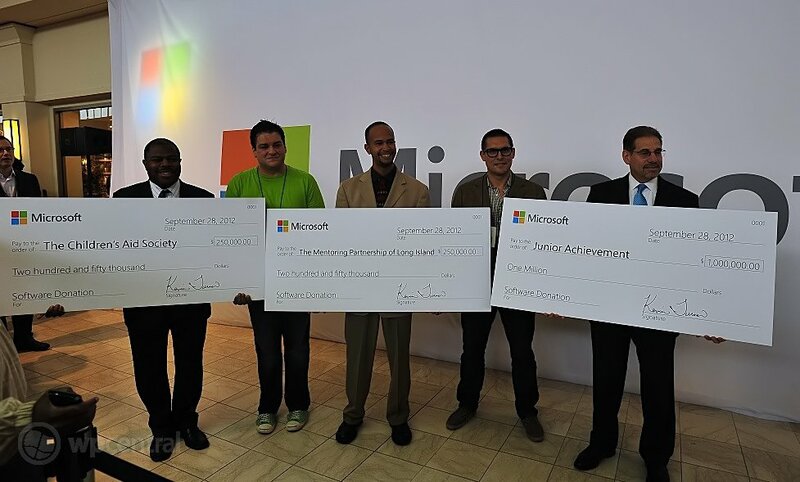 Meanwhile as of 2011, Microsoft has donated $3.9 billion worth of software to non-profits. And while Apple has recently donated $100M to two organizations, Microsoft's own employees matched that in 2011. Look, charity is charity so in the end, it's nice to see any company doing anything. But as someone who actually lives in this local community where Microsoft just opened for business, it feels nice to have a company offering their assistance. And I don't remember Apple doing anything similar.